News is breaking today that U.S. Senator and former comedian Al Franken while on tour with the USO in 2006 posed in a photo as grabbing a fellow female performer’s breasts. The woman’s name is Leann Tweeden, and also claims Franken forcibly kissed her during a rehearsal for a USO tour skit. Tweeden is a frequent guest on the Sean Hannity program on FOX News. Sean Hannity has been vocal in not rushing to judgement in the Roy Moore sexual harassment scandal. 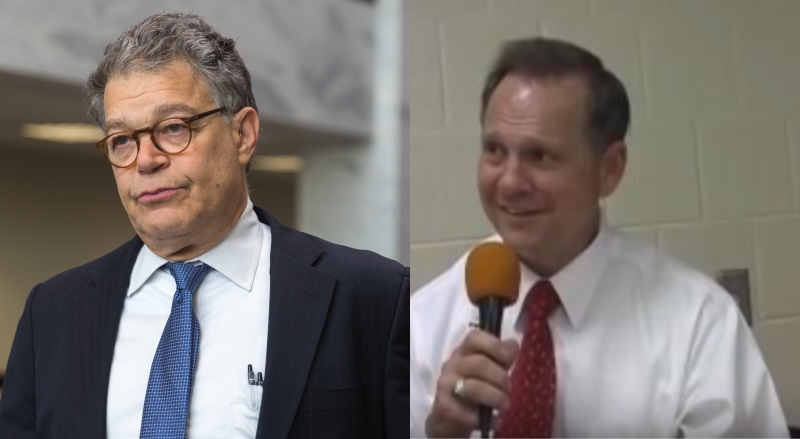 Moore is running as a candidate for U.S. Senate in December, with allegations surfacing weeks before the election that he sexually abused and harassed women when he was working for the state law office in Alabama. Roy Moore has strongly denied any allegations, even claiming his signature in one of the accuser’s yearbooks is a forgery. Senator Franken apologized for the photo. Franken is notable for questioning the Trump administrations current Attorney General Jeff Sessions in Senate hearings on whether he or any Trump campaign staff remembered meeting with any Russian government ambassadors in that continuing scandal where Sessions has been changing his testimony.